Justice Cornell was born and raised in Merced. He graduated from Stanford University in 1969, and The National Law Center, George Washington University in 1972 (with Honors). In December of 1972, he was admitted to practice in the State of California, the United States District Court for the Eastern District of California, and the Ninth Circuit Court of Appeals. In March of 1976, he was admitted to practice before the United States Supreme Court. He practiced law in Merced from 1972 to 1992. He was admitted as a Fellow of the American Academy of Matrimonial Lawyers in 1982, and recognized in Best Lawyers in America in all editions published before he became a Superior Court judge. He frequently lectured and wrote on law related subjects for the Continuing Education of the Bar. He was a member of the Merced County Bar Association from 1972 until 1992, serving as its president in 1979. 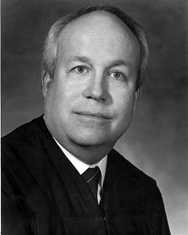 He represented the lawyers of the San Joaquin Valley on the Executive Committee of the Conference of Delegates of the State Bar of California from 1980 to 1983, the Ninth Circuit Judicial Conference from 1985 to 1987, and the Board of Governors of the State Bar of California from 1985 to 1988. While on the Board of Governors, he served as Vice President of the State Bar in 1987-88. He served on the State of California Commission on Judicial Performance from 1989 to 1992. The CJP is responsible for the conduct of all judges in the State of California. He served as a United States Magistrate Judge (part time) for the Eastern District of California from 1986 to 1992, and left that position when he was appointed to the Superior Court. In February of 1992, Governor Pete Wilson appointed him to the Superior Court of California, County of Merced. While on the Superior Court, he served as Presiding Judge on 3 separate occasions. He also served on the Trial Court Budget Commission from 1995 to 2000. The TCBC was responsible for the allocation of all funds to the trial courts of California. In December of 2000, Governor Gray Davis appointed him to the Court of Appeal. Since the beginning of his service as a judge, he frequently has been an instructor for California Judicial Education and Research and the California Judges Association on judicial ethics and conduct and other topics.